Cardiac CTA is increasingly asserting its position as an established tool for the detection and characterization of coronary plaque and stenosis, its morphological evaluation capability, however, falling short of hemodynamic assessment. This fact is of high relevance in the process of therapeutic decision making, which explains the dominance of functional imaging techniques, such as nuclear myocardial perfusion imaging, magnetic resonance imaging, or stress echocardiography. There are four major targets of functional imaging that are particularly critical to the selection of a revascularization procedure over medical treatment strategies: (1) Assessment of myocardial perfusion defects to identify treatable coronary artery disease (CAD); (2) Identification of myocardial perfusion status as an important prognostic factor for the occurrence of future cardiovascular events; (3) Assessment of myocardial viability to guide therapy; and (4) Evaluation of the hemodynamic relevance of detected coronary artery stenosis by flow measurements. 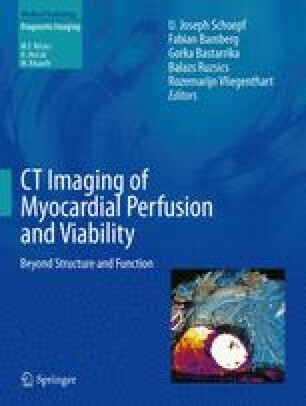 This chapter reviews the current limitations of morphological assessment of coronary stenosis by cardiac CTA, describes available techniques for functional imaging, and enumerates its major targets, which have been well implemented in current management strategies for patients with suspected or known CAD.